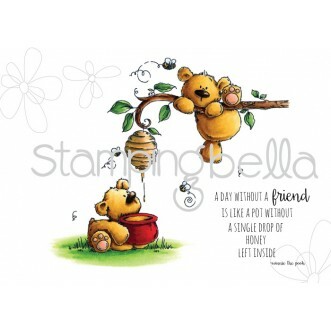 Oh these Honey Bear Stuffies from Stamping Bella remind me so much of Winnie the Pooh! Love them! They make such a cute birthday card! I didn’t use my Copics to color the image this time, but instead used my Prismacolor colored pencils and Gamsol. 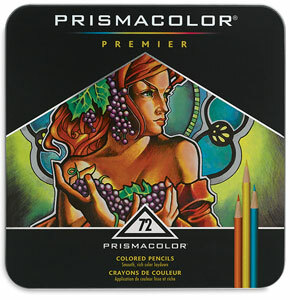 I had used my pencils before with a blender pen, but after watching a video on YouTube where the artist used Gamsol and a paint brush to blend the colors. I had used Gamsol before with a blending stump, but found it hard to get the look I wanted. By using the Gamsol and a small paint brush (not a watercolor brush), I was able to get some great blending. I love this technique, and was able to add more layers of color to the image. The Gamsol removed some of the waxy look of the colored pencils even after the many layers of color that I applied. I like the outcome almost as much as my Copics! I did keep track of the colors that I used and will post them at the bottom under my supply list. To finish the card I added some enamel dots and a fun sun puffy sticker. Happy Friday the 13th! and Happy Crafting!